This book draws on literature, specifically on the writings of selected novelists and poets to widen an existing anti-sport discourse to include hitherto excluded voices from the world of literature. 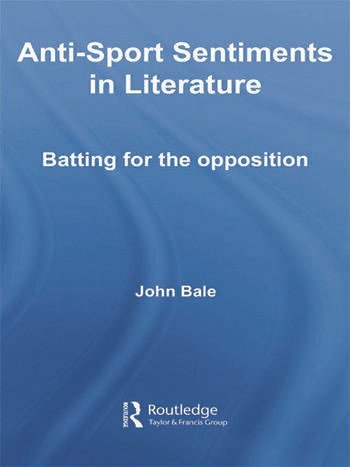 The book commences with a review of exiting pro- and anti-sport discourses and then proceeds to examine, in turn, the written works of five eminent authors, excavating from their writings their anti-sports rhetorics. These writers are Lewis Carroll (Charles Dodgson), Charles Hamilton Sorley, Jerome K. Jerome, John Betjeman and Alan Sillitoe. In its conclusion, the book draws together the broad themes discussed in the preceding chapters. Innovative in its approach to sport and literature and remarkable for its not having been previously explored in any depth, this book will be of interest to readers from both social sciences and humanities backgrounds. John Bale is professor emeritus of Sports Studies at Keele University, UK, and an honorary professor at Queensland University, Australia, and De Montfort University, UK. "There are many things to admire in this book. The opening chapter, for example, provides one of the best summaries of sport and literature I have read in a long time. Bale's close readings of his chosen texts are both sensitive and intelligent, bringing out many new perspectives on the writers. His defence of his subject - the oppositional literature of sport and body culture - is vigorous and persuasive, and set within a wealth of references. " "...this is a fascinating book. It has something of the 'showstopper' quality about it."